What is the letter of Intent? A letter of intent (LOI) is a document that is used to outline one or more agreements between two or more parties before the agreements are finalized. The concept is very much similar to that of a head of agreement, term sheet or memorandum of understanding. Such outlined agreements may be mergers and acquisitions transaction agreements, joint venture agreements, real property lease agreements and several other categories of agreements that may govern material transactions. LOI s are kept short, written contracts, and are usually in tabular form and not binding on the parties in their entirety. However, many LOIs may contain provisions that are binding like the non-disclosure, governing law, exclusivity or covenants to negotiate in good faith. An LOI may sometimes be interpreted by a court of law as binding the parties to it if it too-closely resembles a formal contract and does not contain clear disclaimers. A letter of intent may be presented by one party to another party and subsequently negotiated before execution (or signature). If we someone carefully negotiates, an LOI may be used to serve and protect both parties to a transaction. For example, if a business seller in corp orates form of LOI, what is known as a non-solicitation provision, which would hence restrict the buyer’s ability to hire an employee to that of the seller’s business. Considering this case, should the two parties not be able to close the transaction. On the other hand, an LOI may protect the buyer of a business by expressly conditioning its obligation to complete the transaction if is unable to secure financing for the transaction. To allow the parties to sketch and draft out fundamental terms quickly before expending substantial resources on negotiating definitive agreements, finalizing due diligence, pursuing third-party approvals and other matters. Officially declare that the parties are currently busy in negotiating their business proposal with the buyer, as in a merger or joint venture proposal. It may also lead to the parties engaging themselves in protracted negotiations that are set on only a subset of a deal’s terms. In such cases, parties may also reduce the risk and their lack of a workable deal framework into an LOI so as to increase the chances of getting the deal done and with a hope of making progress later. What Can a Letter of Intent be Used For? Though a Letter of Intent has wide uses and can be used for many purposes. But it is most commonly used prior to the business transactions involving the purchase or sale of shares or assets from one party to another.An LOI can also be used to convey and show that you are interested in leasing or buying a property. Who Should Use a Letter of Intent? Either party involved in a business transaction can create a Letter of Intent to set out terms for a deal. For instance, there is a business which is out for sale and an interested buyer has submitted an LOI to a seller as a formal way to make an offer on a business. At that point, the seller could review the terms in the letter and decide if they wish to move forward with the purchase or if there are negotiations needed beforehand. If the seller agrees to the content in the LOI which was sent by the buyer as a formal business offer then they would give their approval and this would lead them to move into the next stage of the transaction. What is Included in an LOI? Why Should I Use a Letter of Intent? In business or real estate transactions, the purpose of an LOI is to provide an overview to the buyer of the purchase details in advance so that there are no misunderstandings or gaps in the information prior to a binding agreement. It allows the seller to evaluate their options and clearly think about all ups and downs before agreeing to the terms with a buyer and saves on the costs involved with negotiation and due diligence. 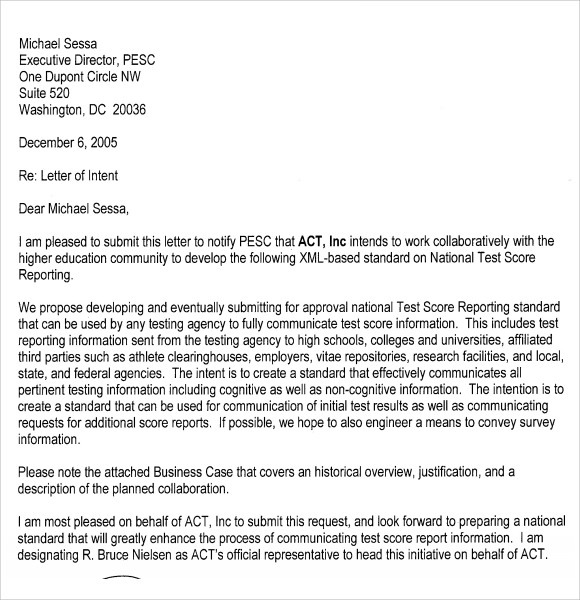 What should be letter of intent in specific letter? The real utility of a letter of intent is that it formalizes a preliminary agreement on a topic before negotiations get underway, it outlines what can and can’t be talked about outside of that negotiation, and it provides a road map that describes how things will proceed. Letters of intent are up for negotiation, as are the contracts themselves. One party may present an LOI, then the other party can counter with edits or a different LOI entirely. Ideally, the end product is meant and supposed to protect both the parties in their subsequent negotiation and fulfillment of the contract that the LOI contains and that they have attempted to agree on. A letter of intent can include provisions that are both binding and non-binding. The ways in which a letter of intent can be binding vary. Some of the least binding LOIs contain a contractual agreement to treat the LOI as non-binding whereas the more binding LOIs can include the rules of negotiation of a contract as a binding agreement. An LOI can specifically spell out elements of an agreement. For example, a date for the deal to be finished, who will write the contract, specifics on financing, these usually include a condition requiring these points to be approved by a board. “Failed letters of intent,” is one of the most binding types of letters of intent, which is used to betray the entire concept of a letter of intent and itself serves as a contract in their entirety. A letter of intent should bring parties together and help lay out terms as a way to reduce the risk of litigation. Letters of intent include non-disclosure agreements or include ‘no-solicitation’ provisions, in a non-disclosure agreement (NDA) the parties agree on what information stays confidential and what information can be shared, hence it would refer to the specific components of the deal. A no-solicitation provision would stipulate that one party can’t hire any of the other party’s employees. The other ways in which an LOI can be used to protect both parties negotiating a deal include provisions that state that the deal can only go through if financing has been acquired by one or both parties, or if that deal has to be made by a certain date. There are certain advantages associated with signing letters of intent for sellers. After all, a signed letter—even if legally non-binding—does signal that the prospective buyer is truly interested in making a deal, thus saving the seller from incurring unnecessary expenses to accountants and attorneys. Indeed, if a seller consents to sign a letter of intent, he or she can take comfort in the fact that it gives the prospective buyer a better chance of securing financing for the purchase (lenders tend to be favorably inclined toward borrowers who arrive armed with letters of intent). But according to Claeys, “the disadvantages of the letter [for the seller] usually outweigh the advantages.” He pointed out that once a prospective buyer has a signed letter in hand, he or she “tends to terminate its ‘courtship’ of the seller and toughen its stance on the details that remain to be worked out, including the seller’s representations and warranties about how the business is doing, the indemnities for a breach of these representations, and covenants about how the business will be run prior to the change of ownership.” Of course, the above-mentioned factors also tend to make letters of intent popular with buyers. Some prospective buyers request that a “no-shop clause” be inserted into the language of the letter of intent. This clause, when implemented, basically means that the seller agrees not to offer the assets or stocks that are for sale to anyone else for a set period of time. Sellers often refuse to include such a clause, because it means that they are turning away other potential buyers for the duration of the agreed-upon period (usually 60 or 90 days) even though the buyer making the no-shop request is not yet obligated to make the purchase (remember the letter of intent, when constructed correctly, is nonbinding). One option for sellers who face this type of request is to ask the buyer for a deposit in return. This money can be used by the seller to cover his or her legal and accounting expenses if the deal ultimately fails to come together. Buyers may balk at this condition, however, reasoning that both parties are responsible for their pre-transaction costs. How to write a letter of intent? EXPLORE YOUR IDEAS FROM DIFFERENT PERSPECTIVES: Take time to explore different ideas from different perspectives, keeping in mind the directions/questions given in the application package. Try to be creative and engaging. Perhaps you will discover something about yourself or your context that will make your statement or letter stand out from everyone else’s and help the Selection Committee see you as an individual and not just one of hundreds wanting admission to the program. HOW DOES YOUR EXPERIENCE LINK TO THIS PROGRAM? : Think about how your previous experiences–academic, extra-curricular and professional–relate to the program and about the personal strengths and accomplishments that you bring to it.Convince your readers that their school, their program is what you need because you have specific interests, aptitudes, and goals. READ THE DIRECTIONS FOR YOUR ESSAY OR LETTER CAREFULLY: If you have questions about content, length or format, contact the university or program office to get clarification. RESEARCH THE CAREER POSSIBILITIES ASSOCIATED WITH YOUR INTERESTS AND FUTURE STUDIES: Talk with your academic advisor, your professors, take out some books or attend workshops. Make sure this is the area of study and the program that will meet your career goals. RESEARCH THE SCHOOL AND PROGRAM TO WHICH YOU ARE APPLYING: Do a thorough search of the university’s website, and program’s web pages. Look at the school, the location, the faculty, the courses, research and publications of program professors, their areas of expertize, and what opportunities for experiential or extracurricular learning are available.Think about the goals of the program that interest you and the reasons why you want to enter this specific program of study. MAKE AN OUTLINE: Before you write, make an outline.Make a brief statement to indicate the theme for each section or question. Use the University’s instructions as the skeleton for your outline. Each paragraph should have a distinct topic, address specific information and follow a theme. FIND A THEME or IDEA THAT WILL UNIFY YOUR TEXT: Your text should create a story about you that follows a thread, builds on a theme. Your text should not read like a grocery list of your achievements, assets, and goals. Make it personal. You’ve always been curious…. you ‘got the bug’ for politics in high school…you took care of an injured bird as a kid…. You’ve lived in many countries, and are passionate about help in others adapt better when arriving in Canada….You grew up with a sick parent, and want to help children cope better…. You’ve always been a writer, actor, designer…. You did some volunteer work that opened your eyes….These are just a few examples of starting places for your ‘story’that can be built upon, creating a unified, genuine, personal, yet informative text. A WORD ABOUT TONE: If you are not excited by the content of your text, your reader won’t be, either.Whatever your ‘story’, be genuine and engaging.Tell the truth about your assets and achievements. Don’t just list your qualities; let the important things you’ve accomplished illustrate how you are vital, independent, resilient, creative, optimistic, dedicated and thoughtful. Turn the negatives or challenges in your life into positives. Show how you are a problem solver! WRITE WHEN YOU ARE FEELING GOOD ABOUT YOURSELF: Your confidence will come through in your writing; your words will come to life. Before you begin your essay, write a letter to a friend or one of your professors, explaining why you should be in the program. This will help you develop an appropriate frame of mind for writing your essay and will get you thinking about the information you might include. If you prefer composing the first drafts of term papers by hand, rather than on the computer, or if you write better in a quiet rather than a noisy atmosphere, follow the same practice when you write your essay. PAY CLOSE ATTENTION TO YOUR OPENING AND CLOSING STATEMENTS: The first few sentences set the tone of your paper and create a mindset for your reader. They will influence the manner in which he or she read the entire essay. The closing statement should leave a refreshing aftertaste, the last thing your reader will remember about you. MAKE YOUR ESSAY CONCISE BUT ELOQUENT: You are more likely to have trouble keeping within the required length than struggling to reach it. Get to the point. Use the language you ordinarily speak; don’t consult your thesaurus to find a more academic sounding language. Be enthusiastic. Let your reader know that you are keen on attaining your goals and that you are proud of what you have already accomplished. READ YOUR WRITING OUT LOUD: If you can’t easily read it, revise! Gasping for air? Shorten your sentence.Does the writing sound contrived? Edit! Make it easy, and pleasant, for your reader to learn about you. LEAVE YOUR TEXT FOR A FEW DAYS: and then have another look at it. Make any changes needed. Ask a writing professional for feedback. Make an appointment with a Learning Specialist or book an appointment with a Writing Assistant. 15.PROOFREAD YOUR TEXT VERY CAREFULLY: A spelling mistake, a ‘cut and paste’ gone wrong, an incomplete sentence, can be easily missed and gives a bad first impression. Details matter. It should be able to stand alone. If the reviewer reads nothing else they should know what you want to do from reading this paragraph. Clearly, mention using simple English what you want the reader to do. For example: consider funding the project. Answer the following: Who wants to do what? How much is being requested? Is this a portion of a larger project cost? Over what period of time is money being requested? Example:The School of Nursing is seeking support for developing an innovative undergraduate and graduate curriculum in psychiatric mental health nursing. That will prepare expert nurse clinicians in the delivery of mental health services to at-risk adolescents in the community setting. We are requesting $87,000 over a two-year period. It may also include what you want to say if you are responding to an RFP (Request for Proposals) or to establish the connection between the foundation’s interest and your project. Keep this paragraph short! This might seem like a lot to address and too daunting, but you will have room later to explain your rationale for the project, your methodology, and to establish your credibility. Project Activity: The “what” and “how” are the questions that form the bulk of the project. Indicate if there will be the collaboration with other organizations and what their roles will be. Be specific about who does what. Indicate how evaluation is part of the project but the next question that comes to mind is that how will you know that you have been able to achieve these outcomes? Put any historical background about the institution here. Clearly mention the general description of the projects funding needs and the total amount of request, to remove the chances of ambiguity. Offer to give any additional information the foundation might need if you feel might be relevant and useful. Include a contact name and contact information in that case. If you are interested then do not forget to mention specifically that you are interested and would like to discuss the project and will “contact their office” by a certain date (keeping the time for them to receive and read the letter in mind). Contact CFR to determine who would be the best person to sign the LOI. Letter of Intent Overview: When you’re negotiating a business deal and the negotiation is getting serious, use a Letter of Intent. It helps protect everyone’s rights and responsibilities, as well as solidifying the relationship between both parties. You’ll want to get the letter in writing before the final negotiations so that both parties know what to expect. You are ready to enter serious negotiations for the sale or purchase of a whole or part of a company or corporation and you would like to define your intentions formally in writing. You are negotiating the purchase of a company or interest in a company and want to exclude the seller from negotiating with another party. Purchase Property Sample: If you want to purchase some property, you should begin by writing a letter of intent to the seller. This includes the basic details of both and terms. Employment for Government: If you are seeking employment in a government department, this PDF template will guide you to write the right letter of intent. University Undergraduate: In order to get into a college program to study a degree a letter of intent is required. This PDF template is designed to help you easily write the letter. Lease Template: In order to lease a property, you as the landlord should prepare a letter of intent to lease that has the basic terms and details of both parties. Purchase Template: If you want to purchase some asset or property, start by writing a letter of intent to show your interest. Using this Word template as a guide, you can write a good letter. Job New Position: In order to show your interest in a new job position available at a company, a letter of intent is needed. High School Simple Letter of Intent: So as to express your interest in working as a teacher at Scarlett high school, a letter of intent is necessary. We have this Word sample letter to help you say what’s in your mind. Purchase Real Estate: Before going into the negotiations to buy some real estate, a letter of intent from one of the parties is necessary as it sets out the terms. 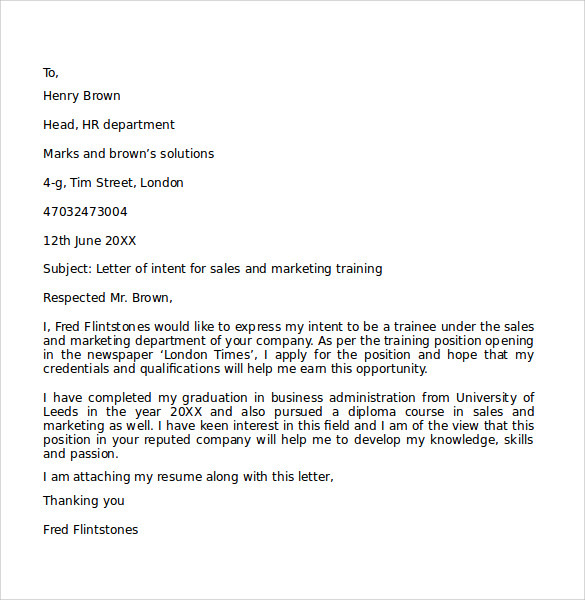 Promotion Purposes: If you want to let your superiors know of your interest in the vacant position of promotion, use a letter of intent. With this Word sample letter, all you have to do it replace the words with yours. Letter of intent is written to an organization, institute or department when you are trying to seek a new job, task or assignment. 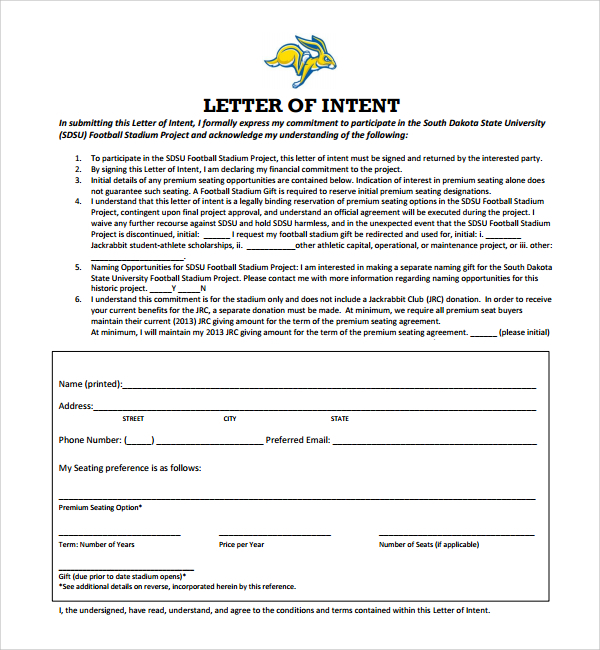 The letter of intent is not specific to how many people are needed to write, it can be given by some person applying to get admission or employment somewhere indicating his intention of joining. For example Letter of Intent is to be sent to a University’s athletic department by a student who is interested in sports or athletics and would like to be a participant in Athletic Association colleges. Then the student can directly write a letter clearly stating the purpose and indicating the student’s interest and skills. National Letter: This letter is being written by a student wishing to apply for some university thereby indicating his/her achievements so far and the interests and reasons he wants to apply. This type of letter should be written in a manner that gives the reader positive vibes and meanwhile, it should also cover all the relevant achievements so that the person on the other end is impressed and gives you the admission. National Letter of Intent Football: A letter written with the intention of getting admission in the football team of a university is a national letter of intent for football. It includes the player’s name and address along with his athletic career’s achievements. He also needs to mention his physical capability and strength as a player and also that he is a team player. National Letter of Intent Signees: The letter of intent states that the terms of the agreement between the two parties have been agreed upon and thus it needs to be signed by those agreeing or involved in the process i.e. the signees. The letter is intended to hold a good prestige and opinion for the person employed in some position as well as to the new employing party or association. National Letter of Intent: A coach of any team can write a letter to the game association or university seeking admission therein. He needs to jot down his career path, where and how he has worked and the teams he had coach along with the achievements or the awards that his team has won so far. National Letter of Intent: A letter could also be written by a trainee to a company asking for an appointment with a trainer. This type of letters are directly written and addressed to the HR department of the company but remember that they should never be directed straight to the director himself. The HR person will decide your joining based on the information you provided in your letter. 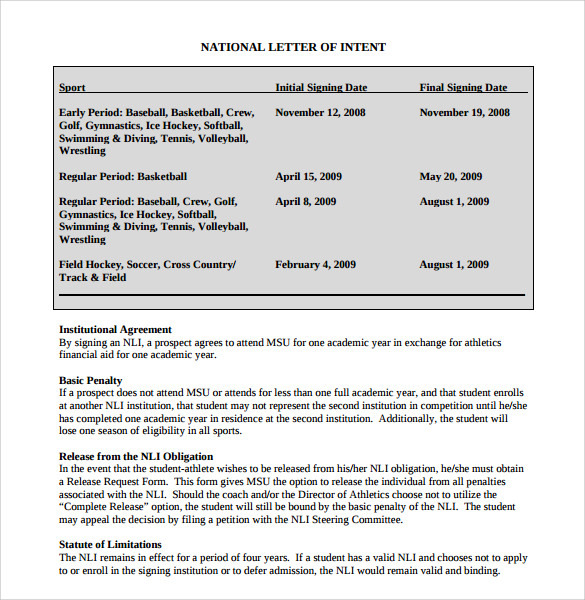 National Letter of Intent Rules Template: There is a certain national letter of intent rules which need to be followed while writing one of its kinds. The letter should contain the dates through which it will remain in force and also the parties involved. It also should bear the terms that are agreed upon so that no dispute arizes later on. 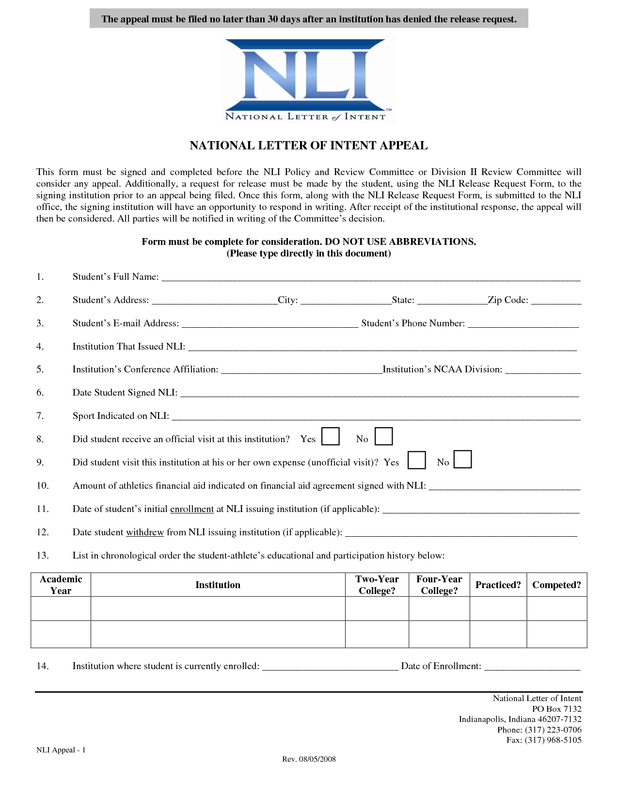 National Letter of Intent: While writing the national letter of intent it is essential that you know your positive points as well as your strengths well that you can display it in your letter. If it is that your letter is the only way of communication and it is the letter who will speak for you, you should take extreme care and make sure that your letter is free of mistakes of any type. National letter of intent is a formal letter and should be written in the formal language only. It should be precise and articulate so that the ultimate motive of seeking admission gets fulfilled. Some of the templates for your help have been stated above. These templates are easy to use and explain how to write the NLI in the best possible manner, to achieve your purpose. Letters of intent are the formal business letter that is exchanged between two parties to finalize on some mutually agreed terms. The idea of writing such a letter is to initiate the process of any business or transaction by one party to the other. While letters of intent are not binding on either of the parties, it is best to agree or reply to the, only after thoroughly reading its contents and understanding it. Before, setting to write a letter of intent one should identify the name of the person and designation to whom the letter needs to be addressed along with correct company name. Remember you cannot by any chance make mistakes at this stage. As most of the letters of intent are meant for initiation of business propositions they should be written in an organized and professional manner. One should ensure to double check the letter for any spelling mistakes or grammatical errors before sending it out. The letter of intent should be written in s brief manner by expressing the main purpose of the letter and not make it too drab.